When you hear this phrase, who comes to mind? David, a man after God’s own heart (1 Samuel 13:14). Joshua, a leader who brought God’s people to the promised land (Joshua 1-5). Peter, the one on whom Jesus built his first church (Matthew 16:18). Paul, an Apostle to the Gentiles (Ephesians 3:1-12). All of these are incredible people who, by God’s grace, knew God and made Him known in powerful ways. We learn from them. We are inspired by them. We, in many ways, want to be more like them. But, who might we be missing? Some other heroes of faith often take longer to come to mind. Ruth, a widow self-sacrificing, kind, and devoted (Ruth 1). Deborah, a catalyst courageously speaking truth (Judges 4-5). Anna, a prophet dedicated to fasting and praying (Luke 2:36-38). Lydia, a hard-worker worshipfully showing hospitality (Acts 16:11-15). These are just the beginning of women of faith who, by God’s grace, also knew Him and made Him known through their lives. In our small groups and Sunday schools, we have strong reason to not overlook the sometimes shorter or less emphasized stories of the Bible, including the stories that highlight women. In fact, we miss out when we do not study these. Amid a culture of women’s rights and feminism, and within the church’s subculture of egalitarianism and complementarianism, what it means to be men or women and the ways we handle biblical manhood and womanhood are intensely debated. We can look to what’s happening around us and our experiences within us to try to make sense of it all. But, why not the Bible?. Just as we look to people in the Bible to learn how to deal with suffering, to learn what fruit of the Spirit we should have, or to explore what it means to trust God, we can look to the Bible to see what it means to be women who follow God. Whether we need this advice or whether we need to encourage women in our life toward seeking God, we can learn from what women (just as we can learn from men) did, what they said, how they prayed and praised. As we dig into their stories, we will learn from their lives. First, we can see their relationships with the Lord. We can see the ways they talked about Him. We can look for the way the knowledge of God shaped how they spent their days. We can see the expressions their faith took: worship, prayer, fasting. We can also see how this relationship and fear of the Lord impacted their relationships with people. We can see the ways they were loyal, courageous, truth speakers, justice seekers. We can learn from their actions about how to lead lives that model God’s truth and grace. What and how can everyone learn from biblical women? Women in the Bible can show us far more than we might imagine. They can show us about relationship with the Lord. They can show us about relationship with others. They can encourage our faith. They can shed light into the sometimes difficult and often deeply personal discussions of manhood and womanhood. Yet, just as any story in the Bible, they can bring us further into the heart of God and spur us forward into a life compelled by God’s love (2 Corinthians 5:14). What can we learn from biblical women? Much more than we might imagine. How can you get started? Try studying, walking through the very texts of Scripture where these women are chronicled. It starts with scripture. Seeking out the stories of women and diving in. But we don’t want to leave you alone in your search. We can help you and help you lead others on this study. LifeWay’s Women’s Ministry Specialist, Kelly D. King, walks us through six stories of biblical women in Bible Studies for Life: Living by Faith – Women who Trusted God. She’ll lead you into the stories of Rahab, Deborah, Hannah, Abigail, the poor widow, and the Samaritan Woman. What you’ll find? Hope, strength, perspective, wisdom, and so much more. Find out more here. Leaders have been described as those who challenge, inspire, enable, model, and encourage. Others call leaders risk-takers, visionaries, and people who see the future and make it happen. Jesus called twelve men to become leaders. Look at whom Jesus called—fishermen, tax collectors, common people who displayed little unusual potential. But Jesus took them and shaped them as He carried out the ministry God placed in His hands. Jesus inspired them, taught them, challenged them, and then set them free with the power and presence of the Holy Spirit. These leaders then became visionaries, world-changers. As a group leader you should feel that God has called you and placed you specifically in your position of service and leadership. You are much like Peter, James, and others who became servant leaders and accepted the responsibilities Jesus placed in their hands. Leaders are essential for a life-changing Bible study group. Every class or group should be a place where people are grounded in God’s Word and engage in reaching, teaching, ministry, and fellowship. Consider multiplying your ministry through mentoring others. The mark of an effective group leader is not in how big your group becomes, but how many people leave the group to serve in another area of the Sunday School or groups ministry. So, our key metric should be how many people are we maturing in their faith so they leave our group and lead somewhere else in our church or start another Bible study group. Churches that effectively use groups in a strategic way multiply leaders and Bible study groups. This just doesn’t happen on it’s own! These churches have an intentional, ongoing plan to multiply their leadership base and increase the number of ongoing and discipleship groups. These churches keep a clear focus on the purpose for their Bible study groups: To make disciples. Bible study groups are central in training other persons to be strong in grace and to teach them to teach others (2 Timothy 2:1-2). Think about ways your personal ministry could be multiplied. Is there someone for whom you could be a mentor? When you multiply yourself in others, you help other believers exercise their spiritual gifts, take intentional actions that are in obedience to the command of the Lord Jesus, and lead people to faith in Him. When seen from this perspective, your relationship with others becomes an exciting adventure! I had just started taking brain medicine again for my hyperventilations. I’d grown up with anxiety—anxiety that was so crippling at times that it landed me in the hospital as a child and in urgent care as an adult. Anxiety that had led me, during one season, to step out of a small group leadership position because I didn’t feel capable of leading. So, I was dealing with debilitating panic (again) in this particular season. I found myself (again) in an office with a sound machine, (again) picking up a prescription that would, as I knew from some experience, help me stop panicking. My response to all these anxiety-related agains was to become very hermit-like and refuse to tell people about my situation. I felt ashamed. Leading a small group again was the furthest thing from my mind. Instead, I just attended one and mostly kept my mouth shut. But, here’s the beautiful thing. When I finally opened my mouth and shared my struggle, I wasn’t mocked or shunned and kicked out of the group. I was given grace and love. A moment of vulnerability that could have caused yet another run of panic instead brought peace. It was special and powerful. If you are a small group leader who struggles with anxiety or panic disorders, or if you lead people who do (chances are this is always the case), here are three things I’d encourage you to keep in mind as you lead your group. A former pastor of mine, Josh Howerton, spoke a lot about “going below the line of shame.” He would encourage our congregation, as they met together in small groups throughout the week, to share, not just surfacey or relateable struggles, but to go below that line we all have, the line that makes us question, If I share this, will I still be accepted? Will I still be loved? The reason he encouraged this in our church body was because he knew the truth and beauty of a Biblical community centered around applying the gospel and living in the light. This is completely transformational — believers exposing and turning from their sin in Biblical community. We should share our sins, our struggles and the “agains” that are trying to crush our hearts. When I was walking through that season of medicating my panic and trying to hide it, I finally decided to share. It felt impossible to even let the words leave my mouth, because I assumed I was more broken than everyone else in the room. But, my small group surprised me by not being surprised. Instead, they were kind and loving, and my willingness to share about this struggle that embarrassed me, prompted others to share theirs. If you are the group leader and anxiety is an issue in your life, sharing it really sets the tone for your group to look to you, not as a “perfect” or “together” leader, but as a co-laborer who understands struggle, just like they do. It is so healthy to share struggles within the context of a small group, but it is vital that the tone of the group be one of gospel hope and encouragement. As a small group leader, you can be intentional about steering your group members away from negativity and toward hope. If they battle anxiety, your group can spend some time sharing verses of comfort and hope. I would also encourage group leaders to make it a point to always end your time together reflecting on the finished work of Jesus.. This is what our lives are about and this is the way we should lead one another — to share our burdens, but look to the cross. I think it’s really important for a group leader to be open and share struggles, as a way of encouraging other members of the group to do the same, but a group leader should definitely not be the only person talking. Once you’ve shared your own struggles and how you apply the gospel to it, listen to the other members of your group. Let them process through their feelings and questions, but don’t just leave it there. Don’t simply wrap it up with a “Let’s pray.” In a small group setting, you have this beautiful opportunity to take sin and struggles of all kinds to the Bible. You have this guide that we hide in our hearts. Share the worries. Then, share the Word. Don’t be afraid to confess your struggles, and always, always, always, point your own self and your people to the hope of the world, our Jesus, who died to defeat everything we’re afraid of. Scarlet Hiltibidal is the author of Afraid of All the Things and He Numbered the Pores on My Face. She also writes a regular column for ParentLife magazine. She loves sign language with her daughters, nachos by herself, writing for her friends, and learning how to be a pretend-farmer with her husband in Middle Tennessee. Every church has a mission – to make disciple. However, every church doesn’t have a strategy to accomplish this mission. Planning (decisions): Tons of ideas exist but a person can do only a few things well. Having a defined strategy helps us make decisions about what will be done and when. Resources (stewards): Every church has a finite set of resources: money, time, volunteers. This is a universal rule period. Having a strategy helps us use the resources we do have wisely. Assessment (goals): A strategy helps us set goals so we can do real assessment. Making disciples is too important for us to think we are doing it simply because we have lots of activity or minimal complaints. On Saturday, March 9, 2019, Allan Taylor, LifeWay’s Director of Sunday School, will host a live Webcast that will look at this issue of strategy. Allan will focus on how ongoing Bible study groups that meet usually before or after a worship service (typically called Sunday School) can be an effective strategy for your church. He will also share some tools and tricks that will help you along the way. Stepping out to start a new small group can be a scary experience. All of us have the same questions starting out: Will anyone show up? Have I invited the right people? Have I picked the right study? How will I disciple everyone in my group? And the biggest question of all: Will my new group survive? Statistics say that around 70% of new businesses will eventually fail within five years. I would hazard a guess that it’s around the same for new small groups in the first year. We all have the best of intentions at the start, but life happens and good intentions get derailed. However, there is hope! There are a few things that you can do now that will help your small group survive and thrive through the whole year. Here are five tips to starting and finishing strong. Inconsistency can derail a small group from the start. There will be weeks where it is extremely tempting to just cancel. A few group members start dropping out early in the week, and now it seems easier to cancel and punt to the next week. After a few weeks of last minute canceling, most people will give up on showing up. Resist that urge to cancel, and stay consistent with your meetings. Some of the most impactful group meetings I have been a part of was with just a few people. Start the group off with a covenant or agreement stating that members will need to be consistent with their attendance throughout the semester, or join the group at another time when their schedules allow. Most people are already involved in a small group. There are smaller groups of people we interact with every day. We have groups at work, groups at school, groups at the football game, groups at the park, and on-and-on. For your small group to be compelling enough for someone to give another time slot to, it has to go beyond the surface and offer opportunities for people to grow deeper in their faith and love for Jesus. If your “study” time consists of 10-15 minutes of shallow conversation about the sermon from Sunday, or how their week was, that’s not enough. To love God, we have to know God, and that will come from those deeper conversations inspired by a well written study of God’s Word. Check out lifeway.com/balanceddiscipleship for a robust Bible study plan. Another difference in what you are offering and what people can get anywhere is genuine care. Your group members are needing more than a social time and a Bible study. The goal is to have your small group feel like family. Families care for one another and are there for each other when circumstances are great and not so great. We should celebrate and weep with our group members equally. Even the best experiences will get old when repeated too many times. If your small group meetings are always the same, the group will quickly become stale and group members will start to fade out. Change it up occasionally with the type of study you are doing. If you are consistently doing studies through books of the BIble, try a more topical study for a few weeks. If your group always uses a video driven study, change it up with discussion driven study for a semester. Also, build in nights where the group just does something fun. Plan a night every six weeks that is a game night, or something fun outside of the normal meeting location. If you are a leader who has to do everything in the group – host, provide food, facilitate the discussion, handle the prayer request, schedule the activities, etc – then you are not empowering your members to discover their spiritual gifts and take ownership in the group. Consumers will feel the freedom to move on when the group no longer fills their needs. Owners have a stake and will feel the responsibility to help the group fill other’s needs. Start the group off with the expectation that everyone will eventually contribute to the life of the group. This will help create owners and not consumers. If you have led any kind of Bible study group, you are familiar with the stress that comes with it. As soon as the group time is over, another one sits in the future awaiting your attention. Responding to individual’s questions that come from the group time just adds to the stress all the more. And it always seems that some crisis at work happens right before a group meeting. Here are a few things we can do to address the stress of leading a group. Prepare. This may be a shock, but winging it only adds to the stress. We may buy into the “I want the Holy Spirit to be free to work in the group time” excuse, pretending that our failure to prepare is somehow more spiritual. The truth is the Holy Spirit is at work outside the group time just as much as He is during it. Sharpened axes tend to be the most effective. Start Early. It is one thing to prepare, it is another thing to prepare on your way to the group meeting. The urgent adds stress and gets in the way of us doing our best. The moment the previous group time concludes, we can start our preparation for the next group time. This gives us time to think about the group time and put together a great experience. Delegate. We can’t do everything and we shouldn’t. The more we take on, the more we cheat someone in the group of using their giftedness within the group. Delegation is a subset of starting early; asking a person to volunteer the day of the group time is unfair. Use a Plan. Half of the stress of leading a group is deciding what will be studied and when. 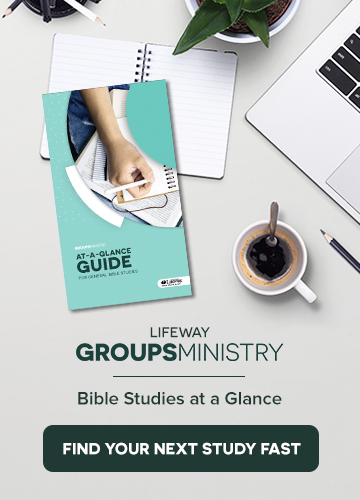 Rely on your church leaders and other experts like LifeWay to create a well thought out study plan for your group. Adapt as needed, but having some plan to adapt removes the pressure of deciding on your own. Get feedback and act on it. Ask someone you trust in the group to evaluate the group time. Look for constructive actions you may need to take to improve as a leader. This is not about being perfect, but about being better. Remember you are not alone. Nothing adds to our stress more than feeling like we are on out on the limb will all eyes on us.The Holy Spirit is present in our preparation, present in the lives of the believers in our group, and stands with us during the group time. God shows up when His truth is examined and we are in partnership with Him. It’s that time of year when kids (and some sugar-craved adults) are running around your neighborhood in crazy costumes to collect candy. Each Halloween, we all think to ourselves at some point, “I wonder who is under that mask?” If you are a small group leader, you’ve probably asked that question about folks in your group as well. They may not be wearing a Spiderman mask to small group, but they certainly aren’t revealing their hearts either. So, how do we as small group leaders create an environment where the masks come off? It’s an important question, because masks hide important issues and struggles. Nine years ago, my wife and I experienced our first of many miscarriages. We were broken. As much as we wanted to cancel small group that week, we knew that as leaders we had an opportunity to be vulnerable with our group. This could go a long way toward us all doing life in Jesus together in the years ahead. We were done with our study and it was time to share prayer requests, so we shared our news from that week. We wept as we opened ourselves up and shared our hurt, our anger and our confusion. The group’s response was something we could have never imagined. Crickets. Nobody said a word. They just sat there and stared at us. It took awkward to new levels. They didn’t know what to do or say, so they did and said…nothing. I finally broke the prolonged silence by praying a general prayer and as people left that evening, a few of the ladies gave my wife a hug to say they were sorry. That was it. It would be really easy for me to get angry with our group for this. Clearly, we were hurt. We were a newer group of young couples and people weren’t totally comfortable with each other quite yet. However, do you know where the blame lies for that awkward evening? Right at my feet. As the leader, I hadn’t created an environment of transparency. I hadn’t yet modeled vulnerability. To that point, our new group was a bunch of people wearing masks who got together to eat good food and read the Bible together. We didn’t yet trust one another, and so everything shared up to that point as a group was fluffy and superficial. I had failed them, and so when we opened our hearts up, it was something they hadn’t experienced before and they didn’t know what to do. A good friend of mine who I co-led a group with years ago often jokingly used the phrase, “It’s time to get naked.” Now, please don’t take this literally at your next small group meeting. It won’t go over well and you’ll end up in jail! But I love what that entails when it comes to our hearts. It’s time to strip away the pride, the embarrassment, and whatever else you are trying to cover your heart up with. It’s time to take the mask off of your heart and allow those you are in community with to see your struggles, your hurts, your emotions, your flaws, and your desperation for Jesus. Doing this once isn’t going to make you a transparent group (see story above). However, modeling a transparent heart, asking transparency of your group each week, and loving and encouraging each other through the transparency is, over time, going to bring you all closer to one another. More importantly, it’s going to bring you all the closer to Jesus. It’s up to you to ask the Lord for discernment in what to share with your group and when. As group leaders, we have to lead the way in bringing our people to a place of transparency. It may be difficult at first, but true discipleship begins to happen when we are doing life together, sharing our hearts and pointing one another towards Jesus each step of the way. May your group continue to grow in heart-level sharing with one another, may you be faithful to care for one another as you share from the depths, and may you pray fervently for those who take off their masks and share what they desperately need from Jesus. Tyler Quillet is the Discipleship Strategist for the Custom Bible Study team at LifeWay Christian Resources. He lives in the Nashville, TN area with his incredible wife, Cathie and two boys, Cylas and Bowen. Tyler spent 15 years as a pastor in Ohio before moving to the Nashville area and is passionate about serving churches and pouring into church leaders in a variety of ways. 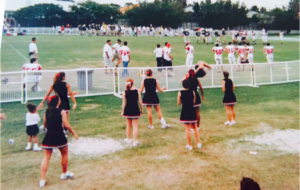 I was a cheerleader in high school. Not the pom-poms and “go team” kind (I didn’t understand football then, and I still don’t today). I did the three hours of practice a day, taped-up wrists, crying and sweating and winning national competitions kind of cheering. Being on the competition team was serious. It was my everything. And if I play out our first national championship winning routine in my mind from start to finish, and remember seeing Jen Granado stick that last heel stretch after having just landed my roundoff-backhandspring-backhandspring-tuck, I can easily trigger a full-blown weeping session of joy and nostalgia. My job on the team was to tumble. I did flips. So I was, pretty much, just responsible for my self—hitting my mark, doing my tricks well, and making the appropriate theatrical, corny faces to go with it. If I really stuck the landing, I would turn to the judge’s table with the biggest, fakest open-mouthed smile I could contort my face into while underlining the “DCS” on my chest with both hands. I was really bad at what we cheerleaders called “stunting”—the thing where we throw each other into the air and catch and lift. I hated it. I didn’t want to get my teeth knocked out. So, I was good at flipping by myself and bad at working with the rest of the team. In the first couple of years, my coaches would challenge me by having me spot the girls who flew in the air. The first time I spotted, the flyer landed on her back and sprained her elbow. The second (and last) time I spotted, our star flyer landed on her coccyx. I didn’t jump backward and away, covering my face while my teammates were falling to their death on purpose. It was instinctive self-preservation! Again, I know! I was the worst! NOW WILL YOU STOP TALKING ABOUT IT, PLEASE! Back then, I loved the buzz of being on the team, but I enjoyed the most isolated role. This wasn’t only a cheerleading thing for me. It was also, really until the last few years, how I functioned in relationships. As a cheerleader, I liked wearing the team uniform, but only if I could do my own thing and not be dependent on anyone or have anyone dependent on me. In life, I always want to be at the party, but you can count on me having to go to the bathroom or slipping out the back door as soon as you go from small talk to deep talk. No thank you. Living this way wasn’t good for them and it wasn’t good for my soul, either. I thought I was okay because my life has always been very busy and full. But, I wasn’t growing. I wasn’t allowing God to use me to do anything in anyone’s life, and then I fought the guilt this brought by distracting myself with more busyness. This has been my pattern until the last couple of years. I joined a small group at church a few years ago, and instead of being at arm’s distance, I actually got involved in these people’s lives and let them into mine. When I was afraid to do something that I knew God wanted me to do, I would tell this group instead of hiding it. I would ask them to pray. They didn’t bulldoze my walls and force their way into my life. They actually didn’t ask anything of me at all. They just lived like Jesus in front of me, and that compelled me to put my defensive arms down. Their Christlikeness helped me notice my own un-Christlikeness and want what they have. I’m doing things and living in ways that would have scared me to death years ago, and it’s bringing me joy. My friendships have deepened and become sources of encouragement, rather that stress. Letting myself be fully on a team with a group of people—tossing and catching and praying and diving under the person who is falling, and letting them catch me when I fall has proven to be such an extreme joy—it’s worth any head bump or bruised coccyx that has come with it. So much has changed since flipping was part of my life. No longer am I the nervous show-off doing, whatever it takes to keep everyone on my team at a safe distance. Now I’m a nervous show-off who does life with people that make me want to be less like me and more like Jesus. Scarlet Hiltibidal is the author of Afraid of All the Things. She loves sign language with her daughters, nachos by herself, writing for her friends, and learning how to be a pretend-farmer with her husband in Middle Tennessee. Follow her on Instagram at @scarlethiltibidal. While the first week of September means Labor Day plans for many, many overlook September 6th: National Read a Book Day. Read a book day? Yes. If we want to lead, we need to read. If we want to grow, we need to read. If we want to bring others deeper into God’s Word, we have to digest words ourselves. After all, a key way God gave us His message was through the written Word itself. You have your leaders leading studies; yet are you prioritizing developing them as not only group leaders, but also followers of Christ? With a little more intentionality, you can help prepare your leaders to maximize their time with the group. When they’re better at what they do, they can better guide others. This developing is simple. Help develop their understanding of why groups and classes matter through studies such as Allan Taylor’s Sunday School Matters: 12 Matters that Matter to Your Church. Fuel their passion for their role as mentor through studies such as Chuck Lawless’s Mentor: How Along-the-Way- Discipleship Will Change Your Life. Equip others to engage with culture. Culture. It’s a buzzword, but we often get caught in the buzz and don’t engage the world around us deeply through our words. We share opinions, but are we sharing strategies and tactics to both truthfully and lovingly engage real people in real places? If we are not intentional in equipping our groups to engage, they will turn elsewhere to learn how. We can constructively discuss social and political issues through studies such as Russell Moore’s Onward: Engaging the Culture without Losing the Gospel. We can delve deeper into issues such as sexual immorality and abortion through David Platt’s Counter Culture. Catalyze groups to rethink the mundane. What if ordinary was actually opportunity? People in our groups can become so disillusioned with life’s daily tasks that we miss what life could (and is) able to be. Daily can mean daily opportunities to make a difference, and each moment is a chance to not only serve but also to actually be happy. Start shifting perspectives through delving into how we can, regularly, make acts of service a part of life’s rhythms in Tony Merida’s Ordinary: How to Turn the World Upside Down. Uncover how, each day, God doesn’t even just want us to be happy but also commands it through Randy Alcorn’s Happiness: God’s Invitation to Delight, Celebration, and Joy. Reading matters. Not just on National Read a Book Day, but every day. Targeting specific, often underemphasized areas to read and study might just even bring more growth to your group than you think. Okay, we’re talking about the three distinctions of a biblical small group, if you remember. The first one is discipleship, so we want to make sure that we are creating disciples in our small group. Second, we want to make sure that we’re building community, that discipleship happens best within the context of community, so we want to schedule it into our group meetings and into our calendar. And then third, what I want to focus on today is mission. How can we make sure that our group is on mission? So I’m gonna give you four things to maybe look at to think about for your group to help your group to start thinking missionally. The first thing you want to do is you want to study it. Choose study that forces your group to think missionally. Lot of the studies that we do are something that we’re passionate about, so kind of revert back to the same types of topics. So if you’re not naturally, if your group’s not naturally bent towards being on mission, choose a study that forces them to think about serving people outside of themselves. So maybe you go to lifeway.com, look at the balance discipleship plan and choose a steady from the serving God and others category, something that’s about six weeks long and take some time to study what does it look like to be on mission and then number two you want to plan for it. Choose somebody in your group that will organize something that you can do maybe on a weekend and something that fits the skills of your group. So choose somebody, talk about it, talk about where are we skilled, and then pick a project for your group to start with to start thinking outside of the group. And the number three, it’s pretty obvious, but we want to do it. So actually make it happen. We can study it, we can plan for it, but if we don’t actually go out and do it than it was for nothing. And so make sure you get a good day and time when the entire group can do something. Maybe a weekend, Saturday morning, a couple hours where you can serve alongside another organization and become missional. The number four, and this is important and we forget this part a lot of times, is talk about it. So as soon as possible, maybe the next group meeting after your project, take some time to debrief. How did it go? How did it make you feel? What can we do differently or better next time? Because what we want to do is we want to move the mindset from a project to a lifestyle. So we go from just thinking about how do we do this project to how do we actually live missionally day by day. So study it, plan for it, do it, talk about it, and let’s become missional as a small group.